For years, scientific studies have proven that adverse childhood experiences (ACEs), such as abuse and neglect, drastically increase the risk for a countless number of social, emotional and physical challenges, including alcohol and drug addiction, mental illness, homelessness and early death. Left untreated, childhood trauma and adversity become a strain on public health and leads to costly and often ineffective adult interventions, including incarceration. The good news is that just one positive and healthy adult relationship helps at-risk children to become more resilient. At Hanna Boys Center, we use a trauma-informed care model that creates conditions for our boys to grow, heal and become more resilient. All of our programs — school, residential, clinical, and follow-on — use this model to help change the narrative of our boys’ lives and prepare them to succeed as adults. To extend healing from trauma in the Sonoma Valley, the Hanna Institute consults with youth serving organizations by incorporating this new science into their work to help our community’s children to become more resilient and productive. Please help us accelerate the growth of Hanna’s impact in the lives of our boys and in our community by participating in this year’s Hanna Fund-the-Future. Your support will fund Hanna’s programs that change the life trajectory of thousands of at-risk children. Each of us has an important role in this process – we ALL want our children to be successful and fulfill their dreams, whether in this room, on this campus or in our communities. We have set a goal to raise $500,000 and to jumpstart our efforts to help our children grow, heal and become more resilient, two loyal supporters of Hanna have generously offered a matching pledge of $100,000 each for a total match of $200,000! 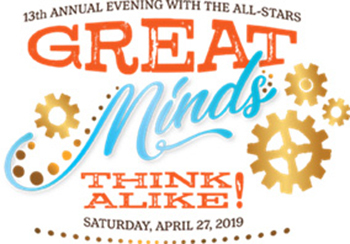 PLEASE Help us to embody our Gala’s theme, “Great Minds Think Alike”, because your gift will immediately be doubled up to $200,000. Please consider a gift and realize that we can all benefit and achieve great heights by this generous offer. Double your investment in Hanna’s future by donating to this fund today! How would you like to fund the future? Please select from one of the six options below. All donors receive the following honors: Recognition in the Hanna Boys Center Annual Donor Report, 2019, recognition in a “Thank You” advertisement and recognition on the Hanna website.